Leaders in healthcare facilities management will join together later this month at the New England Hospitals & Facilities Summit in Andover, Massachusetts on May 28th to discuss innovation in design, construction, energy efficiency technology and more. At the core of the summit will be how to balance patient comfort with the cost of facility operations. Every healthcare facility manager is concerned with improving patient safety, security and comfort while adhering to regulatory compliance and controlling operating budgets. However rising energy costs, aging facility infrastructures and a highly demanding, critical power environment post challenges for facility managers to optimize building conditions. These concerns can be assuaged in part through accurate anticipation of building needs, recognizing potential problems and finding solutions before problems arise. The key is for facility managers to work with experts to focus on infrastructure integration – bringing hospital facilities onto a streamlined, synchronous system. Having a central system that monitors the entire hospital infrastructure allows for continuous analysis, commissioning and maintenance of building operations. The access to full system data provides healthcare facility managers with the information needed to identify areas of energy waste, who is using the most energy and keeping areas at their optimum temperature based on area function. New healthcare facility technology can also sense the occupancy status of patient areas to reduce energy waste, and patients can control their own environment through mobile apps – raising the patient experience, while cutting down on valuable time and energy wastes by making constant individualized adjustments. 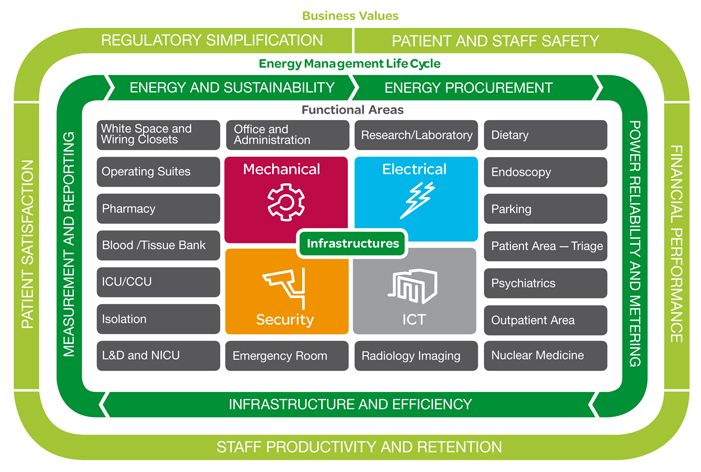 Schneider Electric executives including myself will be participating in the summit to provide participants with critical information on the importance of installing intelligent infrastructures in healthcare facilities. Intelligent infrastructures go beyond electrical needs and help maintain security, regulate mechanical systems and streamline information and communications technologies.